In a rural farming hamlet, surrounded by beautiful Vendeén countryside, our comfortably furnished and well equipped cottages start from only £33.00 per night. We are now taking bookings for 2019. To assist our guests with travel arrangements, we are now taking bookings starting on any day of the week, please phone or email with enquiries. 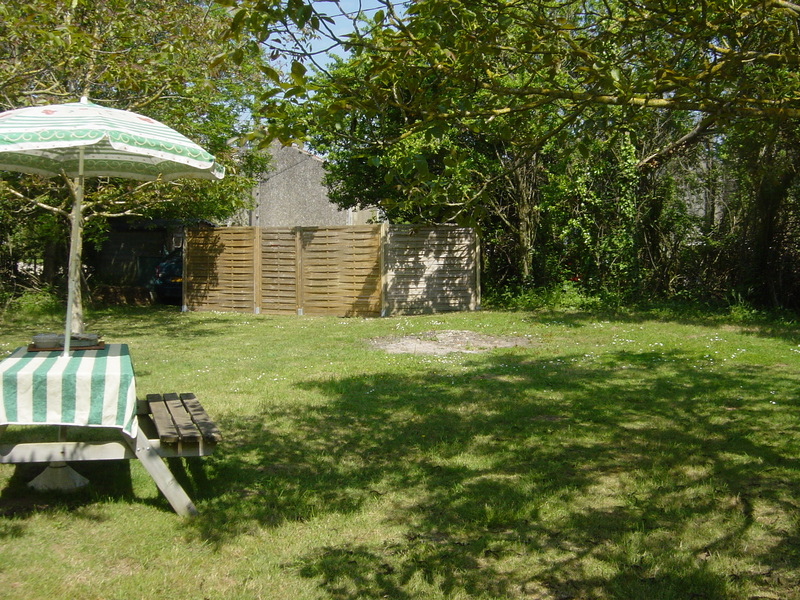 Sunflower Cottage and Kingfisher Cottage are set in a quiet rural farming hamlet in the beautiful Southern Vendée Region of France, not far from the historic towns of Fontenay-le-Comte and La Roche sur Yon and only 1 hour from the wonderful and vibrant fishing port of La Rochelle. Please click here to read the interesting Sunday Telegraph article on La Rochelle. 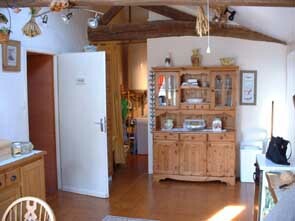 The cottages are just over six hours drive from Calais or Boulogne or three to four hours from Dieppe, Caen or St.Malo. We are happy to help with any aspect of route-planning. Flights are available from many UK airports to the Vendée Region. La Rochelle, Nantes or Poitiers airports, using discount airlines such as Ryanair, Easyjet or BMI. Car hire is available at all three airports. Surrounding the cottages, the quiet countryside remains unspoilt and is a haven for birds and wild life. There are fields of sunflowers in the summer, small streams and rivers to explore and many historic and ancient towns and villages, often with morning markets. Nearby is the beautiful leisure lake of Lac de Rochereau and the magnificent Atlantic beaches are about 1 hours drive away. There are several Chateaux in the area, as well as vineyards open for wine-tasting or you can hire a punt and explore the Marais Poitevin. The magnificent theme park of Puy du Fou is close by. The Vendée has beautiful beaches and sand dunes inviting you to relax. At dusk on the coast, small ports such as St. Gilles Croix de Vie, transform into lively, welcoming evenings with a variety of festivals, folklore pageants, fireworks and magnificent evening shows. 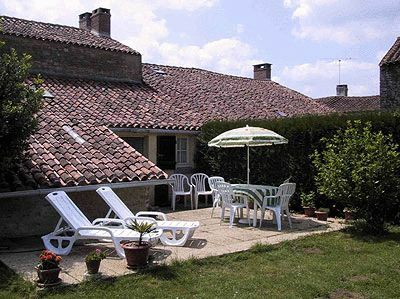 The cottages are only 2 minutes drive from the popular historic village of Bazoges-en-Pareds. This interesting and beautiful village has a medieval tower (Donjon) and gardens open to the public as well as a boulangerie, bar and a well-regarded auberge restaurant. For extensive shopping, petrol etc. 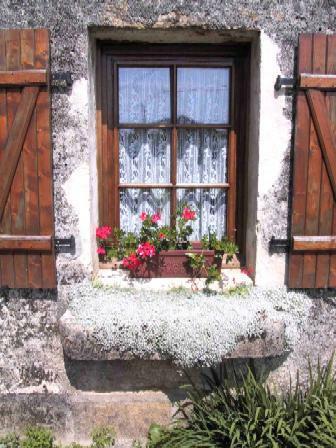 the charming town of La Chataignerie is less than 15 minutes drive through the countryside. Although we do not have a swimming pool at the cottages, less than 15 minutes drive away is a fabulous heated open-air swimming pool available for the public to enjoy. It has a water chute, toddlers pool, sunloungers, terraces for sunbathing and large grassy areas for picnics. There are also well maintained changing rooms, showers and toilets. A small bar sells drinks and ice creams. The pool is open every day from 2.30pm to 7.30pm from 28th June until 31st August. Swimming is supervised by an attendant. Charges are very reasonable, there is a large car park and parking is free. Washing machine, satellite TV/DVD, dishwasher, microwave, BBQ, gardens, ground floor bathroom, 1st floor shower room, bed linen. Sunflower Cottage is a spacious, comfortably furnished and very well equipped country cottage, ideal for a relaxing and interesting holiday in the beautiful Vendéen countryside. All gas, electricity, water and final cleaning are included in the price. Also included is bed linen, with beds made up prior to your arrival. The cottage is cleaned in-between lets. There are no extras to pay for. 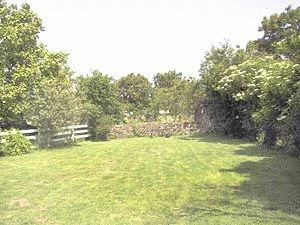 In the front garden there is an old well and stone seat in addition to a wooden picnic table and chairs and sun umbrella. In the cottage, leading off the spacious entrance hall, the large oak-beamed sitting room has a three seater sofa, two seater sofa, armchair and matching leg-rest, as well as display cabinets, lamps and rugs to create a warm and inviting place in which to relax. There are two windows to the front of the cottage, making it a bright and sunny room. The TV receives satellite channels as well as English and French channels and there is a combined DVD player with a range of DVD's suitable for family viewing. There are plenty of books and games provided eg. Chess, Scrabble etc. and the fireplace/woodburner makes a wonderful focus for the room. Two steps lead into the beautiful, bright and sunny country-style kitchen/diner. 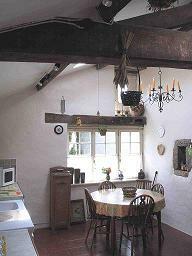 Originally a barn, many interesting features remain, such as the barn window set high above the dining area. 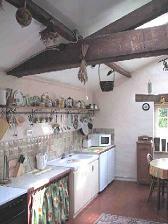 The kitchen has a vaulted ceiling with beams and skylight windows and the kitchen door opens onto the terrace and garden. There is a fridge, freezer, microwave, oven, electric kettle, toaster and a large range of cooking and serving equipment is provided. The dishwasher is in the adjacent utility area and the washing machine is in the ground-floor bathroom. The dining table extends to seat up to eight people, and is set by the kitchen window which overlooks part of the garden. In the adjacent utility area is the dish-washer, iron/ironing- board, cleaning equipment etc. In the evening, the kitchen/dining room becomes a cosy, inviting room in which to prepare and cook a meal, to eat indoors or on the terrace. The spacious ground floor bathroom has a bath with shower over, toilet and wash hand basin. The washing machine is in the bathroom, in common with many French houses. From the main entrance hall, the original polished wooden staircase leads to the first floor landing. The spacious main bedroom has a double pine bed, wardrobe, dressing table, bedside tables and comfortable rugs, lamps etc. An upholstered guest bed provides extra sleeping capacity. The window to the front has views over the surrounding countryside. The second bedroom, which sleeps up to three people, has a single bed and pine bunk beds, chest of drawers etc. The 1st floor shower room has a shower, wash hand basin and toilet. The quiet, spacious country garden is surrounded by trees and shrubs. BBQ, table & chairs, sun umbrellas etc. are provided. The cottage has a terrace and outside light for the evening. Washing machine, microwave, Video/DVD player, ample parking, garden furniture, BBQ, 1st floor shower room, bed linen. Ground floor: Spacious, well furnished open-plan sitting room/kitchen/diner. First floor: shower room with toilet and basin, 1 large double bedroom, (extra sofa bed in sitting room). All gas, electricity, water and final cleaning are included in the price. Also included is bed linen, with beds made up prior to your arrival. The cottage is cleaned in-between lets. There are no extras to pay for. 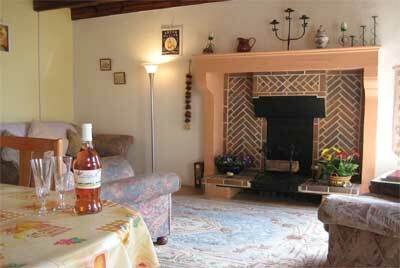 Kingfisher Cottage is a detached gite, just across the driveway from Sunflower Cottage. 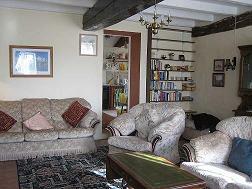 Originally a granary, it has been fully renovated to provide comfortable holiday accommodation for couples. Inside, the fully-tiled, open-plan ground floor has a beamed ceiling, exposed stone work and a feature fireplace. There is a sofa, two armchairs and a small sofa bed, together with lamps and rugs. This comfortable area is ideal for watching a DVD/video on the TV or reading one of the books provided after spending the day at the beautiful Lac de Rochereau or visiting the many historic villages and chateaux nearby. The fully-fitted corner kitchen has a cooker, fridge-freezer, microwave, washing machine, toaster, a clothes dryer, iron and ironing board, etc. A range of cooking equipment is provided and sufficient crockery and cutlery for serving up to six people. There is a large dining table and chairs. A new wooden staircase leads to the 1st floor accommodation landing which leads into the large double bedroom. 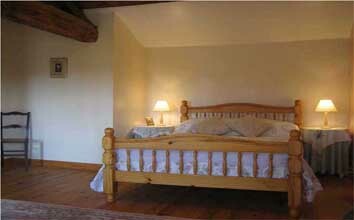 This inviting room has a wooden floor, high vaulted ceiling and original oak beams. The two windows have views of the beautiful surrounding countryside. 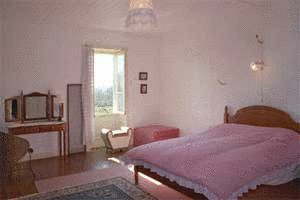 The bedroom is well furnished with a pine double bed, bedside tables and lamps, a large rug and cream-painted wardrobe, chest of drawers, long dressing mirror etc. The shower room has a tiled floor with shower, toilet and hand-basin and plenty of storage for your belongings. 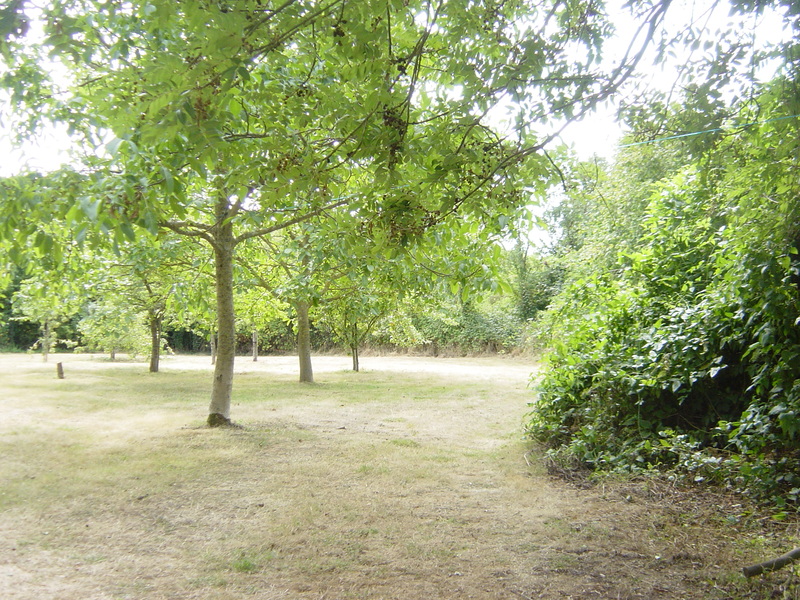 Kingfisher Cottage has use of our lovely orchard, which is just opposite. It is an ideal place for relaxing in the sunshine or under the shade of the walnuts trees. Patio table and chairs together with sun-umbrellas and BBQ are all provided. 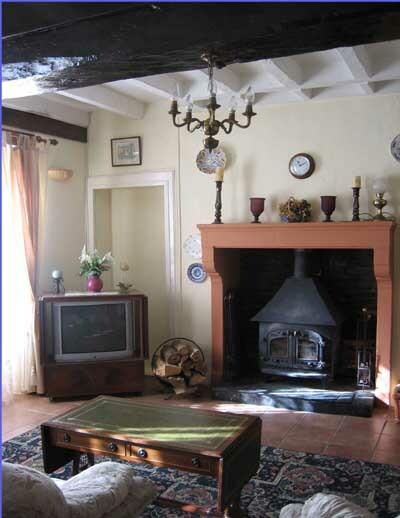 The cottages are set in a rural farming hamlet where the Vendée, Deux Sevres and the Charente all meet. 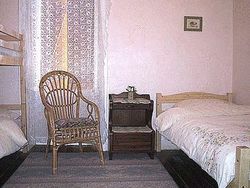 It is a quiet and safe area, ideal for a relaxing and interesting holiday. Just a couple of minutes walk through the hamlet is a beautiful chateau, still owned and lived in by the descendents of the original family. Past the chateau there are open fields, woods and streams, and the gentle undulating hills of the Vendéen countryside make the area perfect for country walks and bird-watching. For shopping, the peaceful and attractive town of Chantonnay has a warm friendly atmosphere and provides a range of shops for all tastes and well as several restaurants. There is a weekly market and a Centre Commercial with a Hyper U, Petol Station, Ma Campagne, Sports World etc. In the centre of the town there are many smaller shops, bars and restaurants as well as a Tourist Office, where is is possible to use the internet for a small charge. Just north of the cottages, sign-posted from the main road to Chantonnay is a beautiful leisure lake, Lac de Rochereau, for boating, canoeing, picnics, fishing, walks and swimming in summer. The lake has a sandy beach and a large grassed area with picnic tables. Parking is nearby and completely free. It is possible to hire canoes/kayaks in the summer. Also there is an outdoor swimming pool in the nearby village of Mouilleron-en-Pareds, which also has several bistros, bank, boulangerie, bars, etc. This area offers something for everyone. 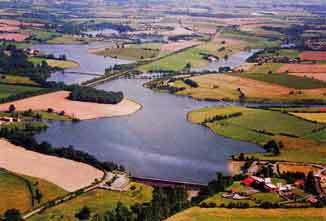 From ancient and historical villages and chateaux to leisure lakes for swimming, boating and fishing. Visit the Mervent Forest with its beautiful lake. Ideal for walking and boating. 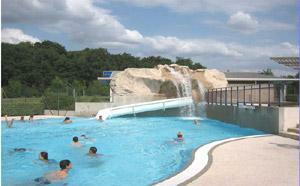 Within the forest is the theme park, Pierre Brune and a zoo or spend a day at the award winning village of Vouvant. Golf and horseriding are within easy reach, as is the magnificent Atlantic coast and long sandy beaches. Take a BBQ and have dinner on the beach while watching the sunset from one of the most westerly points in Europe. La Rochelle, a busy and vibrant fishing port, with its many restaurants serving food from all over the world, is not to be missed. Take a boat trip to the Ile de Re or Fort Bouyard. Please click here to read the interesting Sunday Telegraph article on La Rochelle. * The famous 'Green Venice' In the south-east of the Vendée, around the rivers Sevre and Vendée, is the famous 'Marais Mouille' (Green Venice) where the network of canals and waterways densely bordered with trees can be explored by punt or canoe which can be hired locally. Many villages offer punt hire or guided trips (Velluire, Vix, Damvix, Maillezais). Maillezais offers a good restaurant next to the embarcation as well as the ruined abbey to visit. For more information on taking a boat trip etc., please click here. * Futuroscope – Near Poitiers, approximately 2 hours drive from the cottages, but well worth the journey. Use your Tesco Clubcard Deals to pay for part or all of the entry fee to Futuroscope! Packed with thrills, images in giant-screen format, extraordinary encounters, mind-blowing shows, role-playing, and more. It provides a unique opportunity to see the most advanced cinema techniques from 3D to 360° screens. To visit their website for more information, or to book in advance, please click here. * Grand Parc Puy du Fou - Approximately, half an hours away, this park offers a full day out, packed with fun for all ages, including a Roman amphitheatre with chariot races and gladiators, falconry displays and recreated villages from several different periods of history. The 'Grand Park' with its day-time attractions is open to visitors, without reservation, throughout the season and there is night-time 'son-et-lumiere' open air theatre for which you need to book months in advance. To visit their website and pre-book tickets, please click here. * Parc de Pierre-Brune Theme Park - Fabulous theme park set in the magnificent Mervent Forest, and only about 20 minutes drive from the cottages. A really great day out for the whole family. To find out more, click here to visit their website. * Atlantic Toboggan Park – An exciting waterpark with chutes and slides near St. Hilaire de Riez. To visit their website for more information on this popular attraction, please, click here. * Golf: Anywhere in the Vendée, you are not far from a good golf course - there are five to choose from - La Domangere (Nesmy), which is the nearest to the cottages, or Coex, Port Bourgenay, La Rochelle, Cholet and Niort. For more information on golf in the Vendee please click here, where it is possible to book your golf requirements, before you go on holiday. * Horse Riding - Riding is available at the nearby riding centre of Ripaud-Equitation. The friendly staff speak English and the charges for riding are very reasonable. Although their website is in French, it gives a good idea of what is on offer and prices etc. Please click here. * Fishing: There is freshwater fishing in the many rivers and lakes in the area and permits, for one day or longer are easily available locally at Ma Campagne in Chantonnay, where a large range of fishing equipment etc. is stocked. Sea fishing trips are possible from most of the coastal ports and resorts. 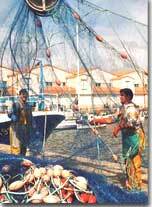 The popular "Pescalis" fishing park, near La Chataigneraie offers extensive fishing facilities. * Cycling: You will find well signed trails along the coast and several inland itineries - ask at the nearest tourist office (Chantonnay). 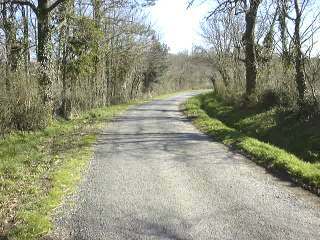 The forest of Mervent/Vouvent offers excellent trails. * Sailing: Beginners and children can take lessons at La Tranche-sur-Mer on a specially prepared lagoon, 1 hours drive from the cottages. * Windsurfing: The coast is very popular with windsurfing enthusiasts, especially around Jard-sur-Mer and la Tranche-sur-Mer. Many of the inland lakes also offer facilities for windsurfing. * Surfing:V Les Conches, or La Pointe du Payre. * Micro-lights: Available near La Tranche-sur-Mer. * Hot-air balooning: Flights available in the north of the Vendée. 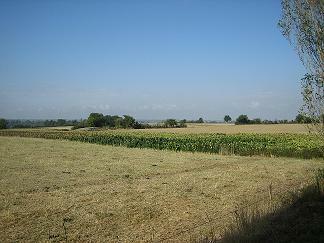 Montgolfiere du Bocage. * Exotic gardens of Court d'Aron - St Cyr-en-Talmondais. Hundreds of rare plants in a beautiful setting. Wonderful lotus flower lakes in bloom from June to September. * Perfumed Gardens at Coex - Exceptional collection of fragrant plants from all over the world, a boutique of natural perfumes. * Museum of Prehistory, St Hilaire la Foret - Reconstructions of stone-age life, museum. * Steam Railway, Mortagnes sur Sevre - 22km of train ride between Mortagnes & Les Herbiers through picturesque valleys and over impressive viaducts. * Velo-Rail, Commequiers - 10km ride through the countryside on a push-pull cart. A real fun day for all the family. Very popular with visitors to our cottages. Take a picnic! * Automobile Museum, Talmont St Hilaire - Over 200 vehicles from 1885 to the present day, including several unique prototypes. * Haras de La Roche-sur-Yon. - A must for horse lovers and an unusual and interesting day. 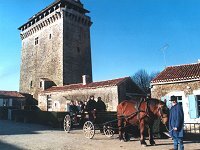 In the centre of Napoleon's Town, La Roche sur Yon, children can discover and handle ponies, watch horses being harnessed, watch dressage and jumping demonstrations, learn about horse-riding through the ages, and watch a demonstration of equestian tradition with music to the horses' rythm. Most of the events/activities are free. * Chateau de la Guignardiere, Avrille - Furnished Renaissance chateau to visit, children's treasure trail, vast park. * Salt Marshes, Les Sables d'Olonne - Guided boat trips through the salt marshes, see traditional salt production and fabulous wild-life. * Zoo, Les Sables d'Olonne - Over 200 animals in semi-liberty in this attractive, well-maintained park. * Historic towns - * Clisson: Picturesque, with its chateau on the river bank. * Fontenay-le-Comte: A splendid boulevard, the river Vendée, an historic old quarter and a chateau to visit. Wonderful market on Saturday with the freshest fish and seafood. * Lucon: Charming town, an impressive cathedral and interesting gardens to visit. * Nantes: Well worth a visit, for its splendid architecture, great shopping and the excellent choice of restaurants in the old quarter. Very busy when Nantes football team are playing at home! * Les Sables d'Olonne - Magnificent sandy beaches and an interesting old port area with many restaurants. Wonderful atmosphere in the warm summer evenings. * Pouzauges: Existing since medieval times, one of the most fascinating towns in the 'Bocage'. 12th century chateau. Very steep hills, but affords wonderful views over the Bocage. * Tiffauges: 'Blue Beard Chateau', (medeival warefare displays), model village, lovely picnic spots on the river bank. * La Rochelle: Just south of the Vendée, in Charente Maritime. The old port with its famous street cafés and restaurants and the historic town centre are well worth a visit. There are boat trips from La Rochelle to Fort Bouyard and the small islands off the coast. A wonderful variety of restaurants serve foods from all over the world. Please click here to read the interesting Sunday Telegraph article on La Rochelle. * St.Gilles Croix de Vie: Vibrant fishing village. Long sandy beach. Mini golf. Casino. Beautiful carousel rides for adults and children. Restaurants, shops and home-made ice cream stalls stay open late in the summer evenings. There are often markets and fireworks over the river on Saturday nights in high season. * Apremont: Charming historic village. Beautiful leisure lake for swimming, etc. Small swimming pool/water chutes for children. Restaurant has a reasonably priced menu and Mini-golf next door. Hire a boat or canopied pedalo and explore the river which runs past the Chateau. Lovely picnic area under the trees by the river. Wonderful day out for all the family. Free parking closeby. * Island of Ré: Reached by a fantastic bridge from La Rochelle, or by boat from some of the coastal resorts. Charming port of St Martin-sur-Re, beaches, lighthouse to visit, cycling in the salt-marshes. Great restaurants. A real must! * Island of Yeu: 1 hour by boat from St Gilles Croix de Vie or Fromentine. You can go right round by bicycle in a day (hire available), passing sandy beaches, wild moorland and rocky coves. * Noirmoutier: Linked to the mainland by bridge and by the famous causeway (Le Gois), exposed at low tide. To download a PDF brochure for more information on things to do in the South Vendee please click here. Long lets are available all year while you are house-hunting or waiting to move into your new property. Excellent rates available. The Vendée is becoming one of the most popular places to buy a second or holiday home or to relocate from the UK altogether. The exceptional road infrastructure from the Channel Ports, together with discount flights from the UK to La Rochelle, Nantes and Poitiers, all help to make the Vendee an easy place to reach. Prices have risen within the last few years, but there are still very many properties for sale that represent excellent value for money. There are several estate agents in our nearby town of Chantonnay and we can highly recommend the agent we used to buy our properties. Also we have many contacts in the local area who would be able to to help you with the purchase of a property and the subsequent arrangements that need to be made; for example setting up a bank account and standing orders for electricity, local government charges etc. Discover France - Guide to travelling to and exploring France. Features information for the tourist, maps, travel tips, france hotels, hire car and flight bookings. For information on ferries, trains, car hire and flights please see the France This Way website by clicking here.